Ahoy there, mateys! 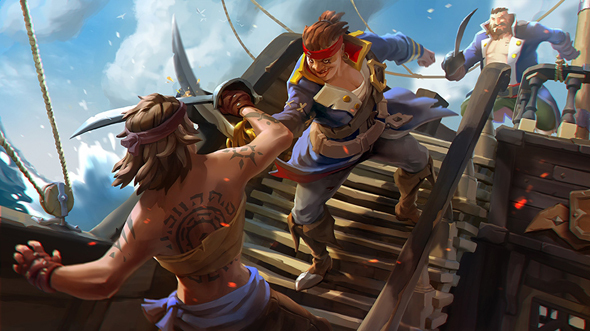 Arrrre you ready for Sea of Thieves closed beta? It starts this week, from Jan 24 to Jan 29. More details below so anchor aweigh and keep reading to know more. Announced on E3 2017 multiplayer pirate simulator changes its aggregation state now: Sea of Thieves beta appeared on the horizon. You can participate whether with Xbox One, and PC. The game is totally cross-platform, so PC master race will face console peasants, which could be an interesting experience. When does Sea of Thieves beta start? How can I participate in Sea of Thieves beta? If you had thought it through, you would probably have signed up for Sea of Thieves Insider Program before December 1 last year. So, if you did, check the mail and follow the instructions. The last and the least way is to pre-order the game. If you pre-order through Microsoft or Xbox store, Sea of Thieves beta appears automatically. If you prefer using another retailer’s service, redeem the code you’ve received and roll: then, beta appears automatically as well. What’s gonna be at Sea of Thieves beta? Not a half of a full game. Not even a quarter. Developers have prepared the special set-up of stuff that is more like a hint for gamers, beta helps to understand what awaits in full game. And leaves some space for your imagination and personal expectations. Sweet. I wanna play Sea of Thieves cross-platform, can I do that? Sure. As said before, the game is cross-platform, so you can play with both Xbox and PC owners. And Xbox Play Anywhere also works, so you can switch between console and PC at a glance, and start where you ended.